Most people will recognise a lobster from their dinner plate and it is often a common belief they are red. However, they only turn red after the cooking process. The common or European lobster (Homarus gammarus) is a very distinctive lobster with large claws located at the front of the body. The claws will be different sizes as they serve different functions. The larger of the two will be for crushing hard prey items, such as mussels and snails. The smallest of the pair is used for slicing. Waving around above the claws, from the top of the head is a larger set of antenna. This compensates for poor eyesight by heightening their sense of taste and smell. It is also true that lobster communicate through urinating from their head. Whilst diving, these are going to be the main parts of the lobster you will see as they hideaway during the day in rocky crevices. 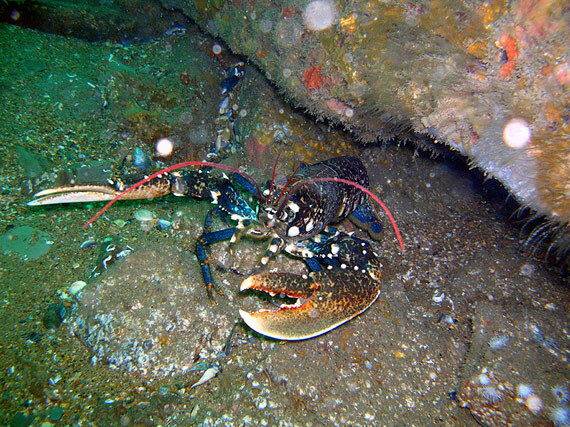 Lobsters belong to the crustacean subphylum along with shrimp, crab and copepods. They are from the order Decapoda as they are a 10-legged crustacean. Common lobsters will use these legs for walking around the seabed scavenging for food; the tail can be used for swimming and avoiding predators. Like all crustaceans they have a hard protective exoskeleton which must be moulted whenever they need to grow. Commercial importance throughout the UK has lead to massive population declines. All around Europe excluding the Baltic. Found from shallow depth down to a recorded depth of 150 meters. Average around 50 meters.